Quirky has a history of making some out there products that are actually pretty cool. The company has a history of making some interesting gear for computer users too with things like articulating power strips and other goodies. The latest product for computer users from Quirky is the new Contort USB hub. 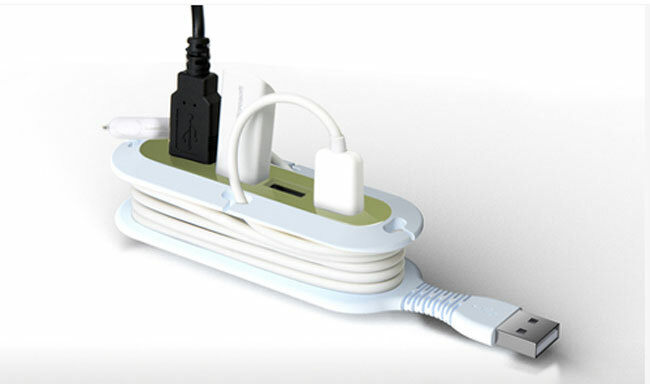 The Contort is a four-port hub with an integrated USB plug that is flexible in any direction to make plugging in easy. On top of the hub are four USB ports and around the hub flange are four cord holders that let you secure the USB cables. The Contort is easy to take with you on the road and it measures in at 34mm W x 142mm L x 24mm H. The Contort can be extended to 36mm high to accommodate more cords wound around its mid-section. Quirky hopes to build and sell 1650 of the Contort hubs and is asking $29.99 each.